Swensen’s is one of those household names that remains a crowd favourite throughout the phases of your life. The unpretentious atmosphere, affordable price range and vast selection of food varieties makes it an ideal spot for family gatherings or a casual date. Like many Singaporeans, Swensen’s was a big part of my childhood. Even after growing out of the kids’ meal era, the restaurant chain still has a firm spot on my go-to list. One of the ways it manages to stay timeless is by constantly reinventing the tastes they offer and introducing dishes in line with food trends and lifestyle preferences. Their recent revamp sees a slew of new menu items on top of their regular signatures. With meticulous consideration towards diners’ diet, health and budget concerns, Swensen’s ensures a scrumptious meal no matter the occasion! 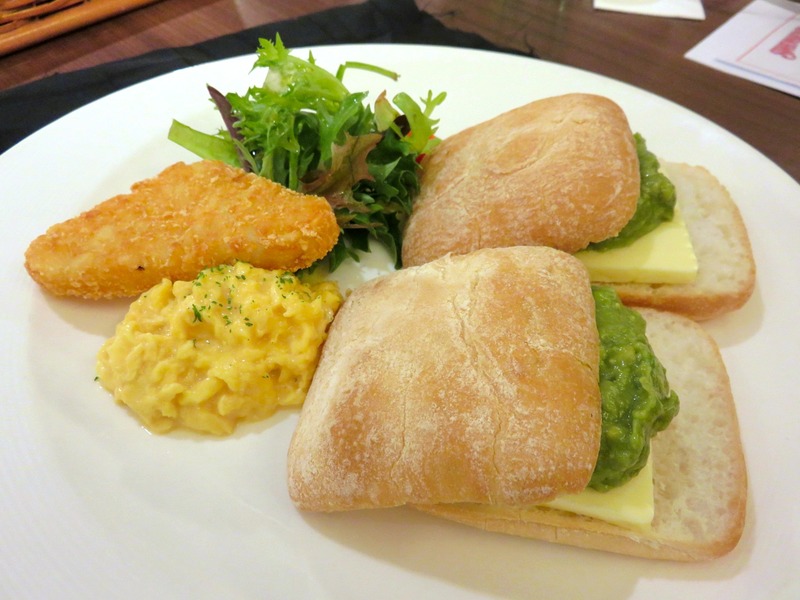 This breakfast special is available exclusively from 8 to 11 AM on weekends and public holidays*, and 3 to 11 AM daily at the Changi Airport outlet. It marries two of Singapore’s breakfast icons: traditional kaya toast from the coffeeshop, and hipster cafe avocado toast. Sandwiched between ciabatta bread, the mixture is swirled in with honey for a sweet yet delicate flavour, which takes away the cloying heaviness that usually deters people from trying avocado. Served with scrambled eggs, hash brown, and a refreshing salad. *Breakfast Menu is not available at Bukit Panjang Plaza, City Square Mall, ION Orchard and Plaza Singapura. 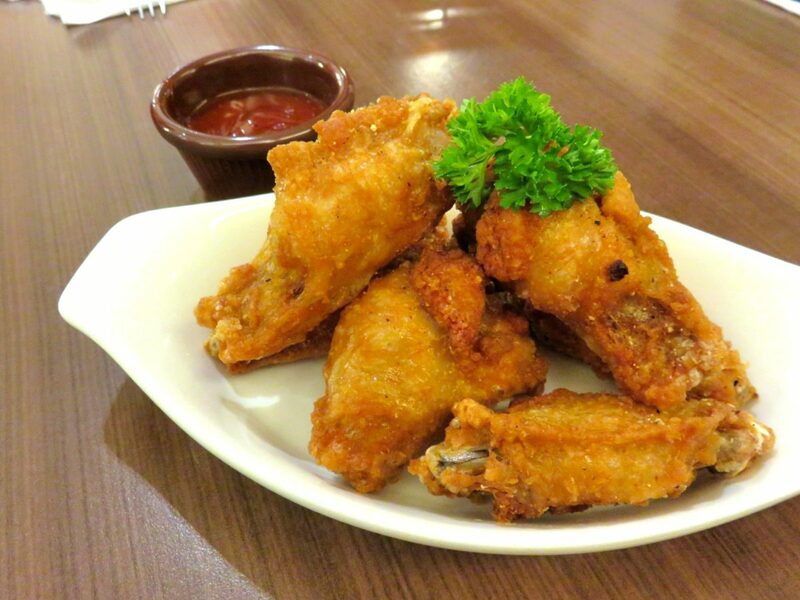 Swensen’s has a plethora of addictive appetizers, and the new kid on the block is the Buckaroo Chicken Wing. Delectably crispy outside with a tender and juicy interior, it’s the ultimate sinful snack to share at the table while awaiting more courses to come. Bored of chilli and ketchup? The wings come with a small pot of homemade pineapple barbecue sauce for a sweet and tangy dip! 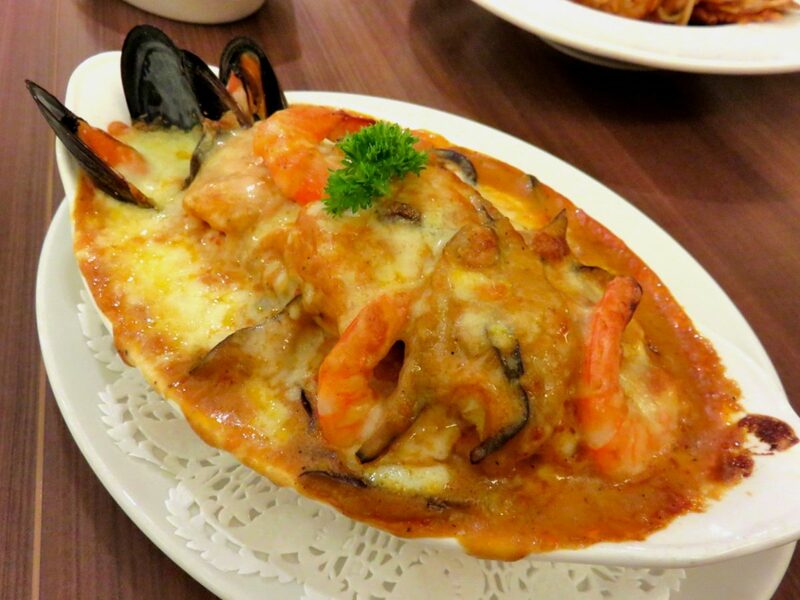 The baked rice dishes at Swensen’s are always a hit, amongst both young and old. Currently offering fish and chicken options, the latest addition is a seafood extravaganza. A glorious variety of fresh seafood lay atop a bed of lemongrass-infused rice, spicy tomato sauce and melted mozzarella. There’s blue mussels, fish fillets, and massive prawns. Dig in to unearth the treasures! If you’ve got an even bigger seafood craving to satisfy, opt for the slightly fancier crayfish pasta. This is actually a past seasonal special that was brought back by popular demand. 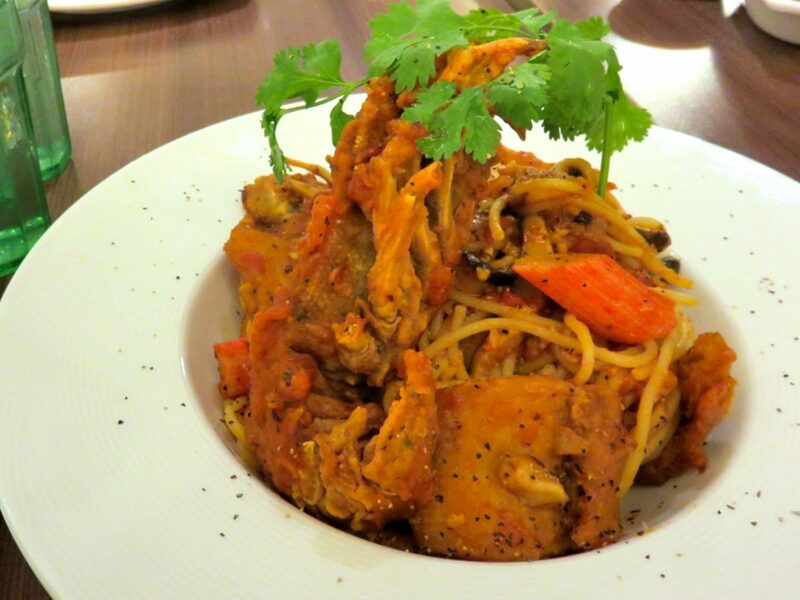 Looking like a work of art, the tangy tomato sauce spaghetti comes with huge chunks of fish, crab sticks, and is crowned by a hunk of crayfish. 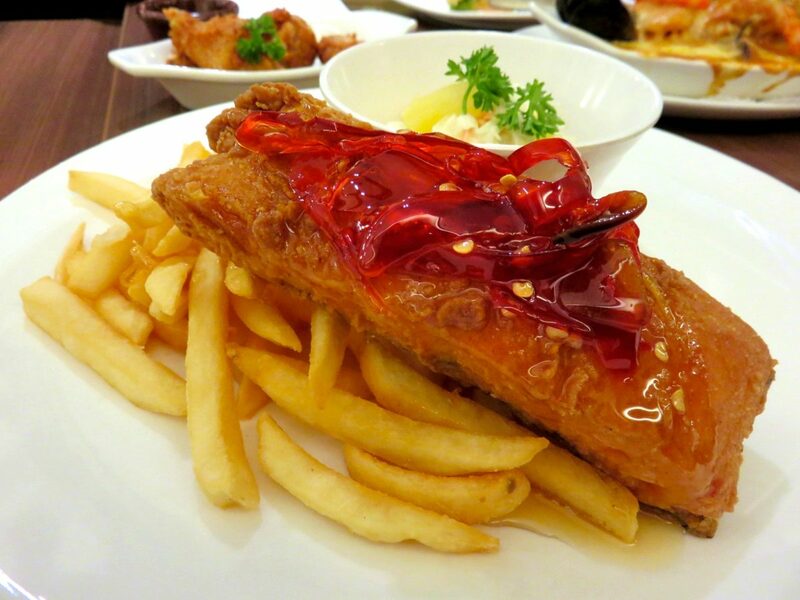 The battered fish and chips at Swensen’s is a staple that many a generation has tried and loved. Now get a load of this deep fried salmon delight! Lightly seasoned and fried til crispy and golden, the salmon is wonderfully tender albeit a little bland. It comes alongside picturesque shreds of caramelised and candied chillies, which pack an insane amount of heat. Careful, there are even chilli seeds dotted around it! For those who are on a budget, fret not. Swensen’s new menu includes pocket-friendly options that don’t compromise on taste, and are actually pretty filling! 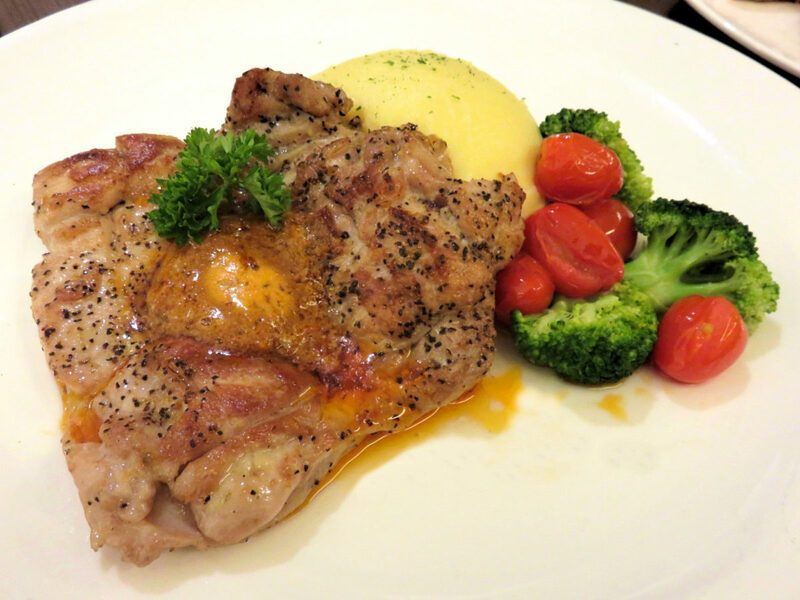 This unassuming slab of meat is levels above your average kopitiam chicken chop. Well-marinated and grilled to perfection to lock in the juices, this boneless chicken is topped with a dollop of delicious sambal butter. A blend of tangy, spicy, and lusciously creamy, it’s unlike anything you’ve tried before. We’ve all had those days where we’re spoiled for choice and take ages to settle on an order. 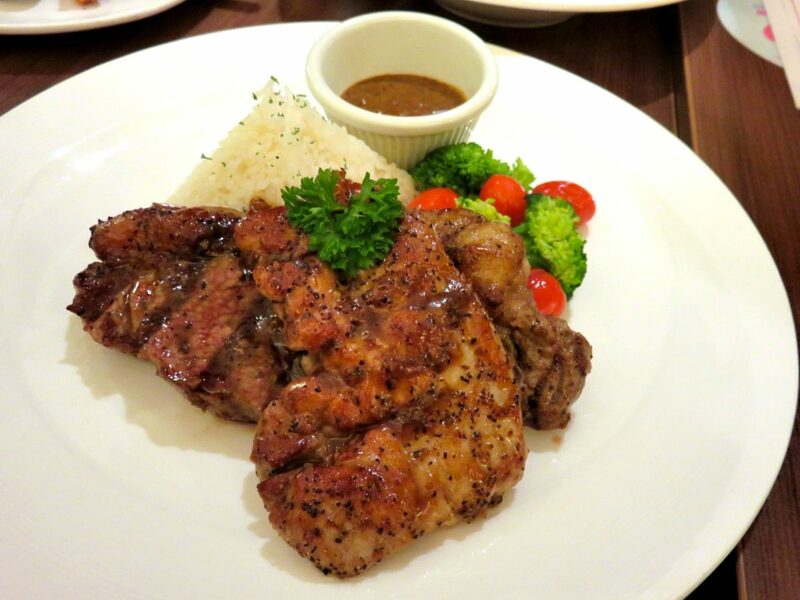 Swensen’s comes up with a combo deal offering the best of both worlds: tender chicken chop and a hearty sirloin steak. Complemented by two side dishes, you can also choose between barbecue, black pepper, or sambal sauce. Considering a steak would usually cost upwards of $20 on its own, this dish is quite the steal! 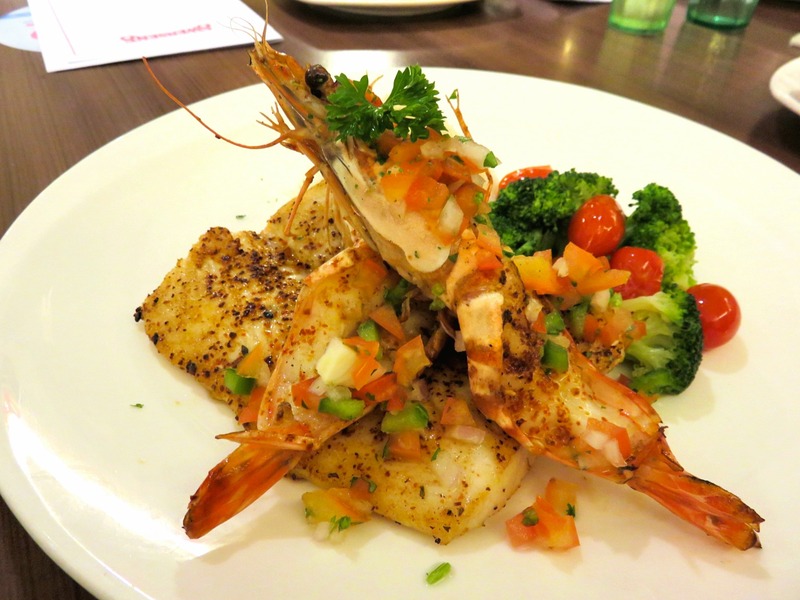 A combo option for those fickle-minded seafood aficionados features a tantalising fillet of dory fish, paired with succulent king prawns that are rubbed with some heavenly spices. Dressed in a homemade tomato salsa to keep things light and refreshing, it also comes with two sides that make it a super well-rounded and satisfying meal. Choose between seasonal veggies, cheesy macaroni, savoury rice, hot U.S. fries, steak cut fries, mashed potatoes, or coleslaw. 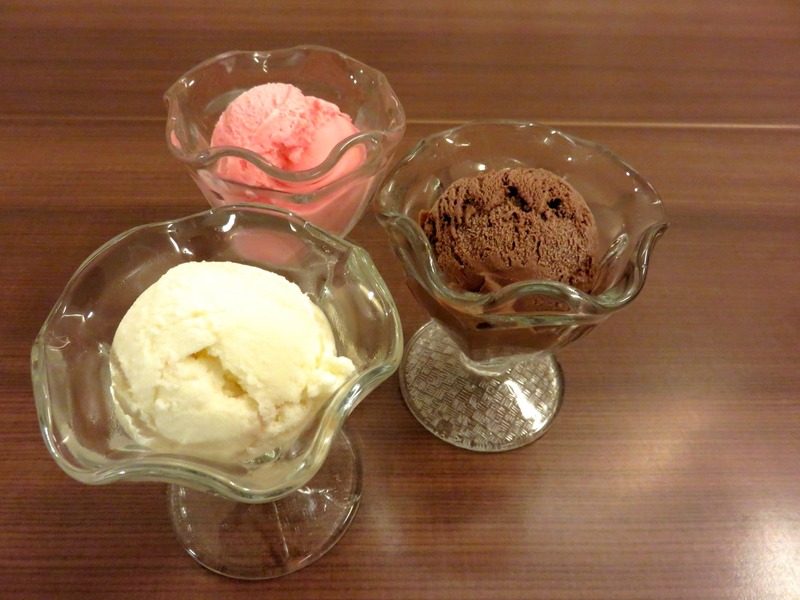 Swensen’s is practically synonymous with ice cream. After satisfying the dessert cravings for multiple generations of Singaporeans, they’ve come up with low sugar options to suit people with dietary restrictions, or who simply want to keep trim and fit! The guilt-free range ($4.50 for single scoop, $7.50 for double scoop) sees three classic flavours that have up to a whopping 39% less sugar than their regular counterparts. Swensen’s is the first restaurant in Singapore to serve dessert that’s been officially endorsed by the Health Promotion Board as being a healthier choice, so feel free to indulge to your heart’s content! My personal favourite is the chocolate, which tastes so rich in cocoa that you’d barely notice it was the “healthier option”. The strawberry features a familiar taste that’s present in common strawberry-flavoured snacks and sweets, but a tad toned down. Lastly, the vanilla has the most obvious absence of sugar, giving it a more milky taste than vanilla. Not particularly bad, per se, but I could see it being a hit amongst folks who don’t particularly have a sweet tooth but are hankering for a creamy frozen treat nonetheless. 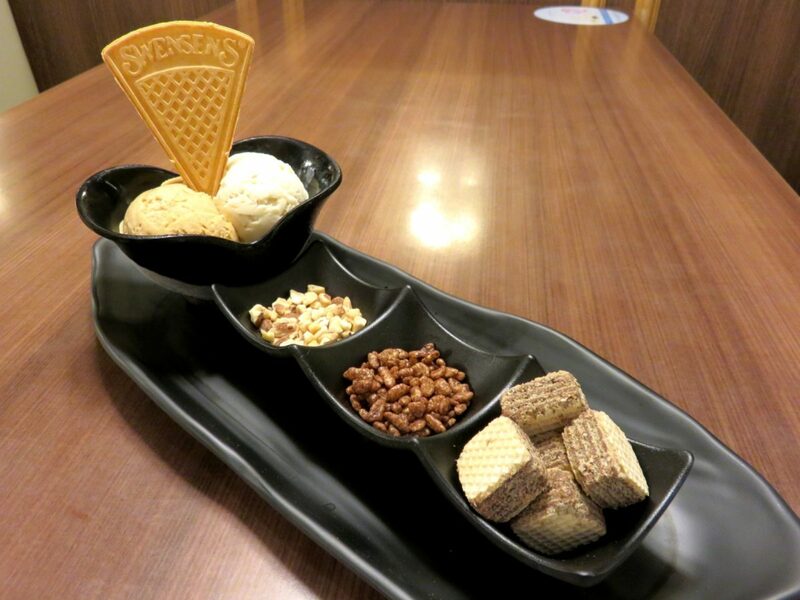 To add to their already extensive array of ice cream flavours, Swensen’s has introduced Salted Butterscotch Crumble as well as Wild Floral Honey Crumble. The former is a divine balance between salty and rich creaminess, while the latter is an explosion of sweet floral flavours that’s sure to wow any sweet-tooths. They also have a new Build Your Own Sundae concept, where you can complement your ice cream ($8.80 for single 3oz scoop, $10.50 for double 2oz scoop) with a wafer and any three types of toppings you desire. The huge range of toppings include anything from fruits, sauces, crunchy nuts and biscuits to melted marshmallow, so knock yourself out and unleash the wild dessert artist within you! Now with new dishes designed to suit the needs of the health-conscious and diners who want to ball on a budget, there’s more reason to patronise Swensen’s than ever before. The mammoth range of food spanning across breakfast, appetizers, and main courses to fulfill every craving means that you can visit them again and again to try something new each time.